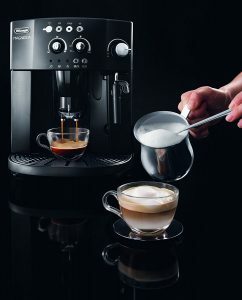 The Delonghi Esam 4000.b Magnifica produces excellent espresso with a professional crema. 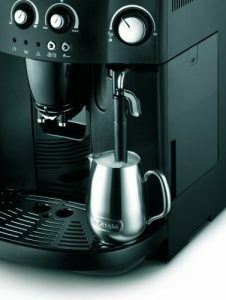 It's affordable (for a bean-to-cup machine) yet it still has a range of features such as a milk frother and cup warmer. 4.1 What is the Machine Made With? 4.2 Is it Possible to Adjust the Coffee Temperature? 4.3 How Does it Compare to Other Delonghi Coffee Machines? 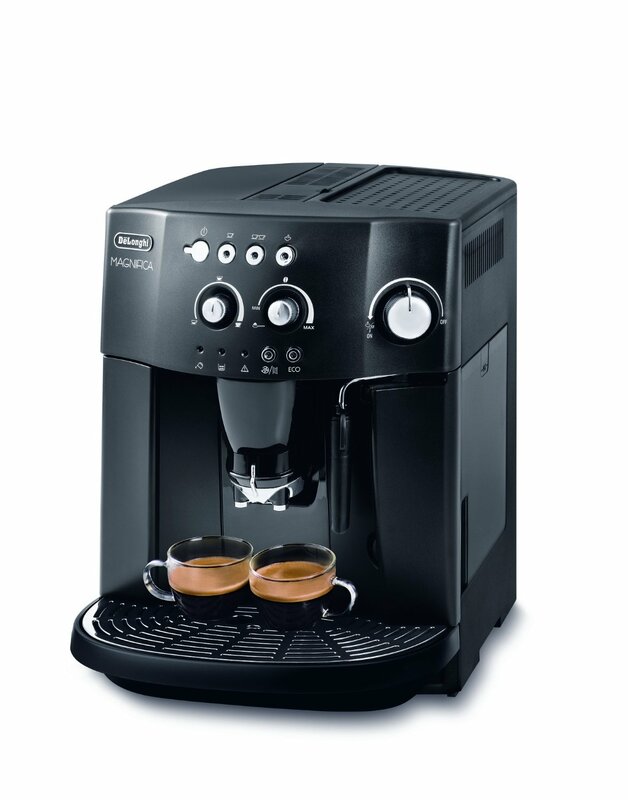 The Delonghi Esam 4000.b Magnifica is a popular bean-to-cup machine that can make espresso, cappuccino and latte. It’s a relatively low-priced model that comes with a variety of customisation settings, including coffee strength and bean coarseness. 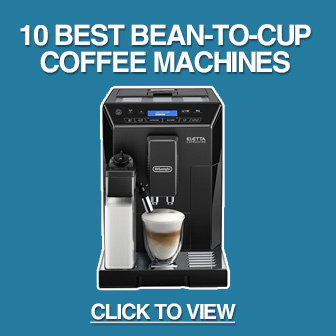 It’s also rated as one of the best bean-to-cup coffee machines on many shopping sites. On the surface, its attractive design, low-budget price and one-touch control panel make it easy to see why it’s one of the best selling models in the UK. But does it live up to the hype? And, most importantly, does it produce tasty espresso? Keep reading our Delonghi Esam 4000.b Magnifica review to find out. The 4000.b is aimed at first time bean-to-cup machine owners or those with a small budget. While it doesn’t have the advanced features of more expensive models, such as an automatic milk-frothing system, it has a surprising number of customisation options. Let’s dive into the features in more detail to see what the Magnifica can do. The Magnifica is a stylish coffee machine. The first thing to note about the Esam 4000.b is that it’s an attractive model. It doesn’t look like a budget bean-to-cup machine with its stylish black and silver colour scheme. You also may have noticed that it can make two cups of espresso at the same time. If you and your partner enjoy coffee together, this is a vital feature to prevent the first cup getting cold while waiting for the second. The second cup can also be used for filling a flask if you want a large coffee for your travels. In addition to the two outputs, the height of the coffee dispenser can be adjusted depending on the size of your cup. For the best results, try to have the dispenser just above the top of the cup. One of the defining characteristics of the Magnifica is how easy it is to use. All the buttons are one-touch and the dials are clear. After selecting one or two cups, the machine starts its coffee cycle instantly without further input. The whole process takes around 60 seconds from start to finish including grinding the beans. Like most bean-to-cup coffee machines, grinding can be quite loud, but the process is quick so shouldn’t be a problem unless you’re making coffee late at night. For milk frothing, the steam arm is also activated with a one-touch button. You can adjust the steam strength using the machine’s third dial. A minor annoyance is that the on/off switch is on the back of the machine. It would be more convenient on the side, especially if you want to save energy by switching it off between uses. There is, however, an automatic standby mode, and you can adjust how quickly this is activated when not in use. Additionally, the Esam 4000.b includes a hot water dispenser. Water is dispensed from the steam pipe if you use the dial without pressing the steam button. This is great for making tea, pre-warming cups or making Americano. The machine has dials for coffee quantity, strength and steam output. Like most bean-to-cup coffee machines, the Delonghi Esam 4000.b has a variety of settings for the burr grinder. These affect the coarseness of the grind. While you probably won’t need to adjust this too much, you might want to play with it a bit when using a new type of bean as it can affect the taste of the coffee. At the front of the machine are two dials. The first adjusts the quantity of coffee, which is useful when you have cups of different sizes. The second adjusts the strength of the coffee. You’ll probably need to test a few different settings to find your perfect taste, but once you’ve done so the Delonghi Esam 4000.b can consistently produce excellent coffee. The machine also has a compartment for ground coffee. You can switch between using the ground coffee or bean compartment with a single button press. If you want to try a new blend, or enjoy the occasional decaf coffee, you’ll use this feature a lot. The espresso from the Delonghi is excellent. The machine is capable of producing an attractive gold crema and the espresso doesn’t taste watered down. In fact, the taste matches many more expensive coffee machines. The machine can make a variety of milky drinks using the stainless steel milk frother. These include cappuccino, lattes and latte macchiato. The machine has a frothing arm but requires you to froth the milk manually in a separate container. While this works great for cappuccino, the machine doesn’t include an automated frothing system such as those found on more expensive models. Fortunately, the frother is easy to use and the machine can make cappuccino with a gorgeous flavour. One of the most common complaints about bean-to-cup coffee machines are that they are difficult to clean. This is because there are often more removable parts than other types of machine. The 4000.b Magnifica has been designed to make cleaning as easy as possible, with a brewing unit that’s simple to remove. The steam frothing arm should be cleaned after every use, but fortunately this is also straightforward and doesn’t take long. Other components need to be cleaned around every four weeks and the drip tray has a simple indicator to show when it needs to be emptied. Brewing units on coffee machines are a common place for limescale build-up, so the Delonghi Esam 4000.b has an automatic rinse cycle. This runs every time you switch on and turn off the machine. The steam output makes frothing milk easy. The Delonghi Esam 4000.b comes with a thermoblock system. This causes the machine to only heat up the required amount of water for your next serving of coffee, which greatly reduces heat up time. There is an eco button on the machine for saving energy. This can be disabled at any time, but is a useful feature for minimising energy costs. The Esam 4000.b has also been rated “A” for energy consumption. A section of the top of the machine is a warming pad. This is great if you want to pre-heat a mug. We think the Esam 4000.b Magnifica provides outstanding value for money. With its range of customisation settings, gorgeous espresso and ability to make two cups at a time, this is as close to cafe-style coffee as you can get in this price range. Delonghi have a reputation for producing some of the best bean-to-cup machines on the market. The model also comes with a two year warranty for extra peace of mind. As the machine was first released in 2012, some reviewers have used it for many years and praise its reliability. Many also praise the quality of the espresso. The compartments for both beans and ground coffee are great if your partner wants a decaf while you prefer freshly ground coffee. For a relatively inexpensive model, the 4000.b produces professional crema. Reviewers also mention that it’s easy to clean. Bean-to-cup machines are always noisy, and the Delonghi Esam 4000.b is no exception – especially on initial startup and grinding. It can take some practice to get the steam arm to produce professional-appearing frothed milk. What is the Machine Made With? The exterior of the Delonghi Esam 4000.b is made with plastic, although it avoids feeling “cheap” like so many plastic products. The plastic exterior is one of the reasons the cost of the machine can be kept to a minimum compared to other models with similar features. Is it Possible to Adjust the Coffee Temperature? Yes, although this isn’t as intuitive as the other functions. To adjust the temperature you need to put the machine in standby, hold the “One Cup” button and wait for the lights below to come on. You can then use the “Two Cup” button to select your desired temperature. The default temperature setting is two lights, and there are four options. How Does it Compare to Other Delonghi Coffee Machines? 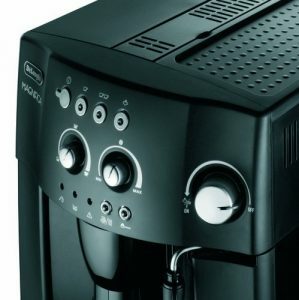 We’ve reviewed a number of Delonghi coffee machines. Most are excellent, although the right one for you depends on your taste, budget and requirements. For a comparison of the various models, read more on this page. The Delonghi Esam 4000.b Magnifica bean-to-cup coffee machine is an excellent option if you’re looking for an affordable model. It produces an excellent cup of espresso and comes with enough customisation options to make your ideal coffee. While it doesn’t have many advanced features, such as saveable pre-sets and automatic milk frothing arm, its relatively low price and easy-to-use design make it one of our top recommendations in this price range. To see the Magnifica’s price, click here.